SAN JOSE, CA--(Marketwired - May 4, 2015) - At the Association for Unmanned Vehicle Systems International (AUVSI) trade show and conference this month, Amimon is showcasing the superior capabilities of their innovative CONNEX wireless HD video transmission solution with support for Futaba's S-Bus remote control protocol to demonstrate the precise camera gimbal control on aerial drones. The integration of Futaba's S-Bus remote control system with Amimon's CONNEX wireless video solution further optimizes operators' abilities to frame the shots they need and want with extreme efficiency. "Our partnership with Futaba provides yet another superior quality to CONNEX and to the aerial video production world," said Ram Ofir, CEO, Amimon. "The ability to precisely control an airborne camera gimbal with zero latency HD video transmission over long distances provides a powerful creative tool unlike anything we've seen to date." CONNEX provides full-HD video transmission capabilities with zero latency up to 1,000 meters (3,300 ft) and is capable of displaying telemetry information using its built in OSD as well as sending control commands via Futaba S-Bus protocol to the gimbal on the air unit. CONNEX utilizes a robust 5GHz transmission frequency with sophisticated 2x5 MIMO and automatic channel selection to ensure resilient connectivity at all times -- free from UAV control interference and other 2.4GHz radio links. CONNEX supports multicasting up to four screens simultaneously, while maintaining excellent HD video. The small and lightweight package includes all antennas, cables and connectors required for air and ground unit setup, allowing for quick plug-and-fly experience. 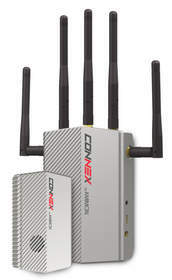 CONNEX is available at the highly competitive and attractive MSRP of $1,599. "The Futaba S-Bus and Amimon CONNEX integration delivers better and more precise control of a drone mounted camera gimbal," said Tsuyoshi Inukai, Futaba. "It's a very useful and practical application for the growing aerial video production market that also adds new elements of creative control to system operators." AUVSI attendees can see CONNEX in action at the Robots in Action exhibit, Booth 332, on Tuesday, May 5 from 1:45 to 2:15 pm; on Wednesday, May 6 from 12:15 to 12:45 pm; and on Thursday, May 7 from 12:45 to 1:15 pm. as well as at their main exhibit, booth # 605. Futaba has been a world leading manufacturer of Radio Control products since 1962. Since that time, Futaba has continuously expanded its product line-up, function, quality, and performance. Today Futaba offers a full range of high quality, standard and custom servo actuators and high performance gas powered engines for UAV/UAS applications. For more information, visit www.futaba-rc.com.